Red, White and Blue Healthy Fruit Pops. Made at home, by you. With the freshest and healthiest ingredients. No need for sugar-laden, chemical-food-coloring-dripping, sticky messes. These will be sticky, and perhaps even messy, but full to the brim with natural and refreshing ingredients instead. These pops are refined sugar free, refined oil free (hey, i donno sometimes oil is found in the weirdest of places), and chemical food coloring free, too! 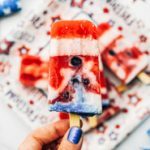 So go make these for the Fourth of July, because it's summer, and it's hot, and the kiddos, as well as adults, will love to cool down with these red, white, and blue healthy fruit pops. Making healthy fruit pops at home is the easiest thing ever - if you've never tried it, you need to right now. It's the perfect snack for a hot summer afternoon. And making them at home means you can control WHAT ingredients you put into your popsicles. No need to wonder or suspiciously guess what-heck-is-in your pops any longer. All you really need is a good set of pop molds. It took me a long time (almost 2 years) to find a good set. My very first set was made out of plastic, and eventhough it got the job done, I didn't feel right about having my 'healthy' ice cream sit in a mold of plastic. Who knows what is getting leeched into the pops, and also plastic is just not really sustainable. like at all. In an effort to reduce my plastic consumption, I knew that my next set was NOT going to be plastic. Unfortunately, about 90% of the pop molds you can find in stores or online are made out of what - you guessed it - PLASTIC. A few things to note. You can get extra creative here and make this a fun project with kids. If you can't find strawberries - you can probably use raspberries or some mix using hibiscus tea instead. As far as the white layer goes - I like to keep my fat intake low, so I use lite coconut milk in a can, but you'll probably get a better creaminess factor if you use full fat instead, up to you! If you don't have blue spirulina - you can always opt for a natural food coloring (something like these ones that are vegan and contain only natural ingredients), or you can just use blueberries instead for a touch of blue. I don't recommend blending the blueberries because they'll turn purple instead. Allrighty friends, that's all for now. 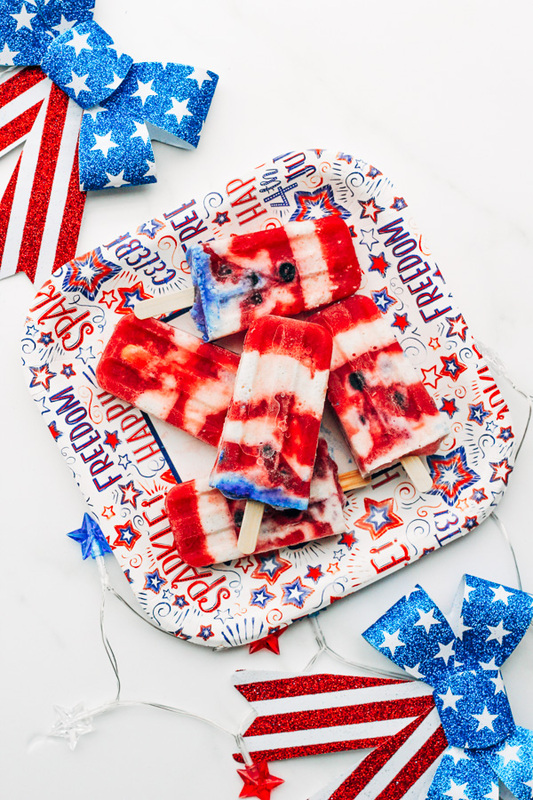 I hope you all have a fantastic Fourth of July, and I hope that you get to make some of these tasty and refreshing pops for friends and family! Want to see more summer favorites? Check out this Colorful Summery Vegan Quinoa Tabbouleh, or these Summer Recipe Round Up that features recipes that are perfect for all summer long. 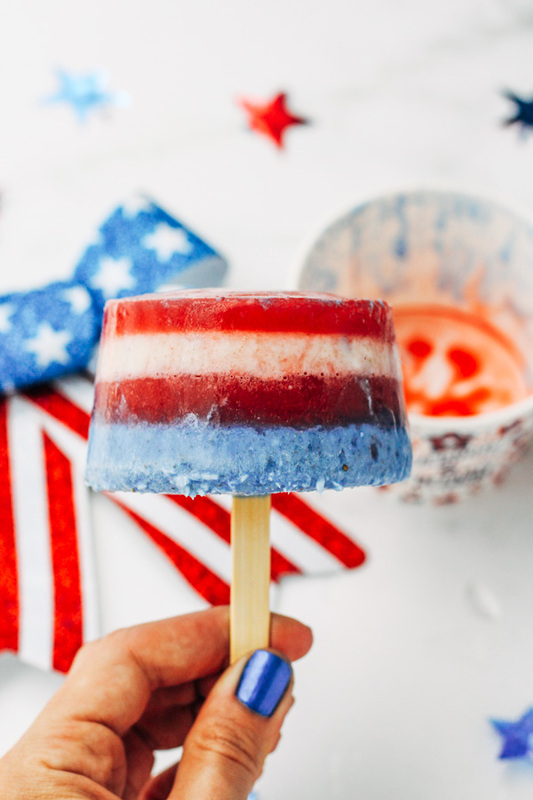 A sweet and healthy treat that is perfect for all Fourth of July celebrations! Beat the summer heat with these no-sugar-added tasty pops! 1/8 teaspoon of blue spirulina – I use the Raw Nice Blue Spirulina brand. If you do not have blue spirulina on hand, you can leave it out and use whole blueberries mixed in with some of the white cream (see picture). You’ll need around 1/2 cup of blueberries. Red Strawberry Lemon layer: place all ‘red’ layer ingredients in a blender and blend until smooth. Pour one tablespoon of this mixture into your pop molds and place molds into freezer. Pour the rest of the red mix into a separate cup and set aside. White Lime Vanilla Coconut layer: Add all ingredients to a blender and mix until smooth. Remove 6 tablespoons of the white mixture, pour into a separate cup and set aside – this is the cup we will use for the blue layer. Now, using a tablespoon, pour one tablespoon of white mixture (from the blender) into the pop molds. Make sure you wait until the first red layer is frozen, usually takes about 15 to 20 minutes, if not your colors will mix, which is not a big deal and still looks pretty but just a tip. Pop back into the freezer to allow the white layer to freeze. Continue alternating the colors – one tablespoon of red and one tablespoon of white, making sure to freeze the molds for about 15 minutes in between each color. If using the same size pops as I did – you’ll get around 5 to 6 layers. Once you have about 1 inch of space left up top, leave it empty for the blue layer. Blue layer: There are two ways you can finish off your pops. Option A is using blue spirulina for a natural food coloring alternative (the brand that I use has absolutely no after taste), or you can use your own natural food coloring of your choosing. If opting for option A – go ahead and mix 1/8 teaspoon of blue spirulina (or your food coloring of choice) to 6 tablespoons of white coconut mix that we separated earlier. Using a tablespoon, pour the blue layer into the pop molds. Option B – if you do not have blue spirulina on hand, and no other natural blue food coloring, you can also simply mix a few blueberries with the left over white coconut layer and use that as your final layer. If you process the blueberries they will turn purple, not blue! So I opted to leave them whole for a hint of blue. See pictures for reference. Once you’ve got the molds filled freeze your pops overnight, or for at least 6 hours. Don’t forget to insert Popsicle sticks before the pops freeze over completely. Enjoy! If you do not have pop molds – you can use cups. Maybe try finding ‘Fourth of July’ themed cups and you can use those instead. See pictures. Please note that although most pops are more or less the same size, my instructions are for pops that hold 1/2 cup of mix. If yours are smaller or larger, then quantities will differ.